Photo by Flickr user Monica L.
A tiny Oak Cliff spot has the best in town for Dia de los Muertos. This time of year, I think of pan de muerto, the pan dulce you see everywhere in Mexico in the weeks leading up to Dia de los Muertos, Nov. 1. And therefore, inevitably, I think of Maroches Bakery in Oak Cliff, which has the best I’ve found in Dallas. The bakery, housed in a historic building across the street from the Kessler Theater on Davis Street, turns out the festival bread from August until Nov. 15, but in the weeks leading up to the holiday, they make mounds of it and sell out daily. Pan de muerto is an enriched bread, a bit like panettone or brioche. You can find versions at Fiesta and La Michoacana markets, where the sugar-topped loaves form bright displays alongside elaborately decorated sugar skulls. (In Mexico City, the tradition is to top them with pink sugar, and you see those variations here, too.) But they have nothing on the loaves that come warm out of the oven at Maroches, rich and heavy with butter and eggs, sumptuous with a light touch of orange blossom water. They’ve been making the decadent treats for 16 years. If you have other favorites, chime in, but I’ve found no better. And I love their off-beat take on the altar to ancestors and other loved ones, often bright with marigold petals, skulls, and Katrina figures. 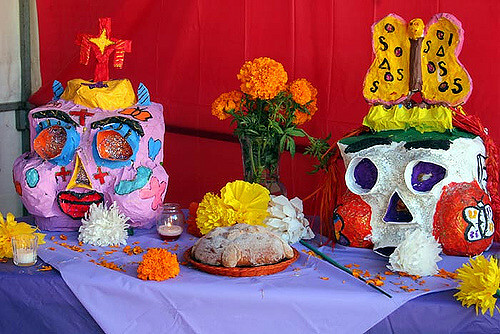 This Saturday Oct. 29, they’re also holding a day-long festival with face painting, Aztec dancing, ballet folklorico…and of course pan de muertos, which you can also try baking at home. Photo by Flickr user Gwen.